During my 18 years of education (19 if you count Kindergarten), I only had two teachers that encouraged thinking. One was my high school science teacher. At the end of class he would frequently say, "Read the chapter, then sit back and think about what it means and how it applies to the broader world around us." The other teacher was a professor of psychology. In his theories of personality class, he encouraged discussion and would incorporate whatever we were talking about when he walked in as the introduction to his lecture. He gave partial credit for any answer that made sense on a test. I was happy to find a book on Amazon titled Learning to Think - Thinking to Learn. 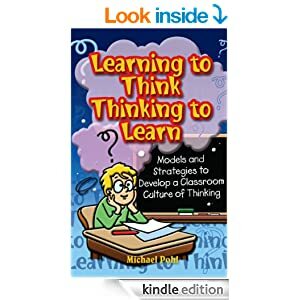 The author, Michael Pohl, shares summary versions of several learning paradigms including Bloom's Taxonomy, Gardner's Multiple Intelligences, Eberle's SCAMPER, and many others. In the book, Pohl describes each learning paradigm and shows several examples for different ages of students of how to apply the concepts. Towards the end of the book he shows how to combine different theories together. In this way, students can be challenged in several domains of learning while the processing of learned material becomes more complex. One of the aspects that I immediately saw is that at least some of the paradigms can be applied beyond education. Over a series of posts, I'll be describing four that I believe can be helpful when applying thinking in any situation - school, work, and personal decision making.